The first science fiction story I can remember reading is Lords of the Starship. The book depicted cultures that were so far from my experiences as a farm boy in rural Ohio that they blew me away. After reading that book, I’ve wanted to learn about new culture: not only about Terran cultures, but about cultures that were beyond my experience or my ability to directly experience. Books like Dune and Startide Rising fueled that interest. A lack of science fiction, especially after the failure of Stargate Universe and Stargate Atlantis, started my search for other genres that might feed my interest. That’s led me to anime, where I fell in love with series like Chrome Shelled Regios and Corpse Princess. In the context of these (comparatively) august anime titles, why would I defend MONSTER MUSUME EVERYDAY LIFE WITH MONSTER GIRLS as a standard bearer for my love of different cultures? Commentaries and viewers seem to treat it as a salacious series dealing with various ways to sexualize non-humans like lamias, harpies, and centaurs. This series caught my attention for a very simple reason: it’s more than that. A recent editorial at Anime New Network crystalized the idea for me. The show’s not just about sexual situations with non humans. Okay, it’s partly about that, but it also treats differences in the characters’ cultures seriously. 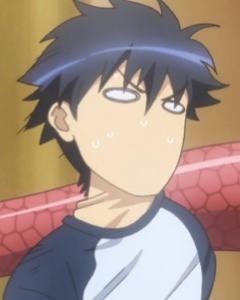 Miia, the lamia, tries to interact with Kimihito Kurusu, the main character, and often breaks him. He’s suffered a dislocated shoulder, lacerations, and sprains (in episode 6, I thought she’d broken his neck!). Miia does that because she’s treating him as if he were a lamia, and her inability to adapt is what’s causing him so much trouble. Darling-kun nearly suffered a broken neck — among other bones — in this episode! Screen capture from Crunchyroll’s stream. There are similar examples with Centorea, the Centaur, and Papi, the Harpy. The key idea is that the series makes an honest attempt to maintain the integrity of the characters, including their diverse backgrounds, as they vie for Kimihito Kurusu’s affections. To his credit, he strives to understand them as they are, in an attempt to respect their cultures. He doesn’t ask them to adopt Terran/Japanese standard conventions. In fact, he violently reacts to others who try to impose such concepts on his house mates. The series’ fidelity to the non-human characters’ cultures and points of views captivated me. Watching the characters come together to face their problems guaranteed I’d stick around. I really enjoyed watching Miia, Papi, and Centorea compare notes about what to do about Suu, the slime. I had a real sense that they cared about her and wanted to protect her! I also enjoy the ragged edge of Miia’s frustrated scream (like when she can’t cook) and Papi’s brain overheating as she tried to understand the legislation that allows her to stay with Kimihito Kurusu. In other words, it was the fusion of the show’s culture fidelity with the growing affection and teamwork that I really enjoy. 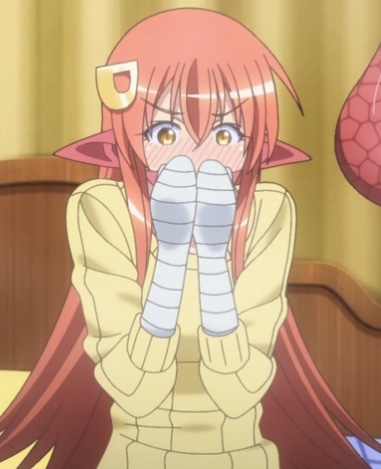 Miia seemed pretty embarrassed by the whole thing. Screen capture from Crunchyroll’s stream. That’s what keeps me watching this show. In the end, I wonder what it says about our culture that sexual content overrides concepts like affection, relationships, teamwork, and family? When did we so divorce sexuality from all other aspects of out own cultures that we’d relegate a series that explores these issues to the fringes? Whatever the reason, I thoroughly enjoy Monster Musume because it feeds my drive to experience cultures beyond human norm. I couldn’t ask any more of fantasy or science fiction!